Is content uniformity an issue for your product? 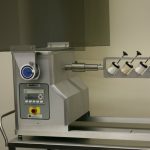 GlobePharma’s PowderExTM , Accelerated Powder Segregation Tester, is the tool for formulators to detect this segregation at its earliest, prior to costly production runs. Blend uniformity is significant in the foundation for a consistent product. Although the original blends will pass initial blend uniformity testing, they are subjected to additional process post-mixing. These processes, possibly involving an auger, vibration or screw feeding, vacuum transfer, etc. – may potentially lead to segregation of the ingredients, which in turn may lead to unacceptable content uniformity.